Researchers examining the impact of climate change on coral reefs have found a way to predict which reefs are likely to recover following bleaching episodes and which won’t. Coral bleaching is the most immediate threat to reefs from climate change. It’s caused when ocean temperatures become warmer than normal maximum summer temperatures, and can lead to widespread coral death. A key unanswered question has been what dictates whether reefs can bounce back after such events, or if they become permanently degraded. An international team of scientists found that five factors could predict if a reef was likely to recover after a bleaching event. 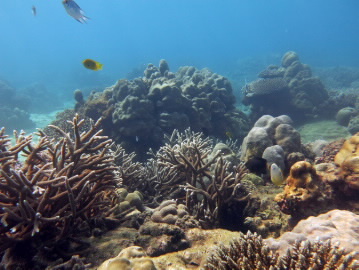 “Water depth, the physical structure of the reef before disturbance, nutrient levels, the amount of grazing by fish and survival of juvenile corals could help predict reef recovery,” says study lead author, Dr Nicholas Graham from the ARC Centre of Excellence for Coral Reef Studies at James Cook University in Australia. “Remarkably, the two most easily measured variables - water depth and the physical structure of the reef before disturbance - predicted recovery with 98% confidence,” Dr Graham says. As part of the research, published in the journal Nature, researchers from Australia, the United Kingdom and France examined nearly 20 years of coral reef data gathered from the Seychelles. Data was collected before and after an unprecedented coral bleaching event in 1998, in which 90 per cent of the country’s corals across 21 reefs were lost. Of the reefs affected by the episode, twelve recovered while nine did not. The event had a significant impact on the biodiversity of local fish populations, which changed substantially when reefs did not recover. From their data, the researchers identified thresholds for the factors that dictated whether reefs would recover. “Putting numbers on the threshold points at which reefs either recover or degrade helps predict reef futures under climate change,” Dr Graham says. Study co-author, Dr Shaun Wilson from the Department of Parks and Wildlife, Western Australia adds that the findings are important for predicting reef futures under climate change. “The beauty of this study is that easily acquired measures of reef complexity and depth provide a means of predicting long term consequences of ocean warming events,” Dr Wilson says. “The ability to predict which reefs have the capacity to recover is really important for mapping of winners and losers, and risk analysis”. Co-author Dr Aaron MacNeil from the Australian Institute of Marine Science says the insights can be applied to studies and management aimed at improving the outlook of coral reefs around the world. “This gives reef management a major boost in the face of the threats posed by climate change and, encouragingly, suggests people can take tangible steps to improve the outlook for reefs,”Dr MacNeil says.